Barluga in Morpeth Call 01670 505000 quoting 'Restaurant Week' to book or call in during the week. Beadnell Towers Call 01665 721211 quoting 'Restaurant Week' to book or call in during the week. Bistro 62 in Bedlington Call 01670 821624 quoting 'Restaurant Week' to book. Bouchon Bistro in Hexham Call 01434 609943 quoting 'Restaurant Week' to book or call in during the week. Cafe Lowrey Call 01661 820357 quoting 'Restaurant Week' to book or call in during the week. Carlo's Fish & Chips in Alnwick Just call in at any time during Restaurant Week. DK at Vallum Call 01434 672 406 quoting 'Restaurant Week' to book. Vallum Farm Just call in and mention Restaurant Week to claim! Foxton's Wine Bar & Restaurant in Berwick Call 01289 303 939 quoting 'Restaurant Week' to book or call in during the week. Harley's Tea Room in Rothbury Just call in and quote 'Restaurant Week Offer' when ordering your meal. Junction Restaurant call 01670790888 quoting 'Restaurant Week' to book. La Bodega Tapas Call 01670 516055 quoting 'Restaurant Week' to book or call in during the week. Matfen Hall Hotel Golf & Spa Call 01661886500 quoting 'Restaurant Week' to book. Milan Italian Restaurant Call 01668 283692 quoting 'Restaurant Week' to book or call in during the week. Mucho Gusto in Hexham Just call in at any time during Restaurant Week. Newcastle House in Rothbury Call 01669 620334 quoting 'Restaurant Week' to book or call in during the week. No19 at The Close House Hotel Call 01661 852255 quoting 'Restaurant Week' to book. Spurreli Boutique Ice Cream Just call in at any time during Restaurant Week. The Barn at Beal Call 01289 540044 quoting 'Restaurant Week' to book. The Barrasford Arms Call 01434 681 237 quoting 'Restaurant Week' to book or call in during the week. The Battlesteads Hotel & Restaurant in Wark Call 01434 230 209 in advance quoting 'Restaurant Week' to book. The Beresford Arms in Whalton Call 01670 775225 quoting 'Restaurant Week' to book. The Black Olive Cafe in Alnwick Call 01665 603673 quoting 'Restaurant Week' to book or call in during the week. The Congregational Gallery in Rothbury Call 01669 621900 quoting 'Restaurant Week', booking advised. The Corbridge Larder Call in to either branch at any time during the week to claim your offer. The Elk's Head Call 01434 345282 quoting 'Restaurant Week' to book or call in during the week. The Kitchen Garden at Meldon Park Call 01670 772 321 quoting 'Restaurant Week' to book or call in during the week. The Linden Tree Pub at Macdonald Linden Hall Call 01670 500 033 quoting 'Restaurant Week' to book. The Northumbrian Piper Call 0191 2856793 quoting 'Restaurant Week' to book or call in during the week. The Pack Horse Inn Call 01665 589292 quoting 'Restaurant Week' to book or call in during the week. The Punchbowl Inn Call 01207 255545 quoting 'Restaurant Week' to book or call in during the week. 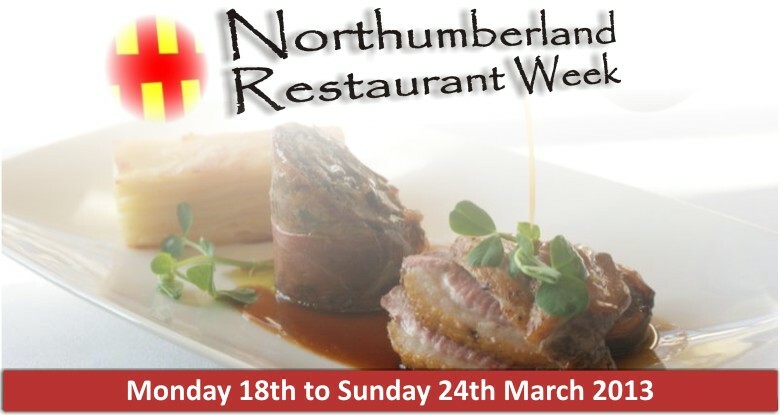 The Queen's Head in Rothbury Call 01669 620470 quoting 'Restaurant Week' to book. The Running Fox in Felton Call 01670 787090 quoting 'Restaurant Week' to book or call in during the week. The Salmon Inn Call 01289 305227 or call in during the week. The Ship Inn Call 01665 576262 quoting 'Restaurant Week' to book or call in during the week subject to availability. The Tapas Bar in Alnwick Call 01665 606601 quoting 'Restaurant Week' to book or call in during the week. The Three Wheat Heads in Thropton Call 01669 620262 quoting 'Restaurant Week' to book or call in during the week. The Treehouse Restaurant in Alnwick Call 01665 511852 quoting 'Restaurant Week' to book. Tomlinsons Cafe in Rothbury Call 01669 621 979 quoting 'Restaurant Week' to book or call in during the week.